A visitor believes her Aussie dog has eye problems and would like to know why her pet's eyes are so red, dry, and swollen. The Dog Expert shares some possible causes and offers advice on what to do next. 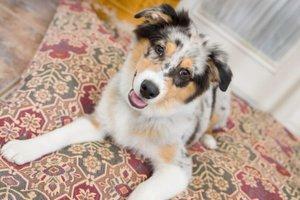 I have a four-year-old Australian Shepherd. About a year ago he started having red irritated eyes, and his hair started getting very frizzy, dry and coarse. I put eye drops in his eyes every day. About two months ago, his eyes got very swollen and had a film over them; so I went to the vet and got some eye drops. They looked better in about a week, but they still are irritated and red so I have to keep giving him the eye drops. What would cause this in a dog? Eye problems are somewhat common in Aussies. I'm surprised your vet didn't investigate the cause of your dog's condition more thoroughly when he prescribed the eye drops. Allergies: Just like people, some dogs cannot tolerate dust, mold spores or pollen, to name a few irritants. Conjunctivitis: This can be caused by bacteria transferred to the eyes when a dog rubs them to stop the itching. Entropian: This condition causes the eyelids to turn inward and irritate the eyes. Progressive Retinal Atrophy (PRA): This is a degenerative disease of the retina. Thyroid disease: This can cause eye problems as well as the coat condition you describe. The film you saw forming could be an ulceration or even a cataract. If the drops improved the condition it was probably an ulcer. Since thyroid disease and PRA are both prevalent in Aussies, I recommend you make an appointment with your vet to specifically discuss the recurring eye problems and push for a diagnosis. Then you will know better what course of treatment to pursue.